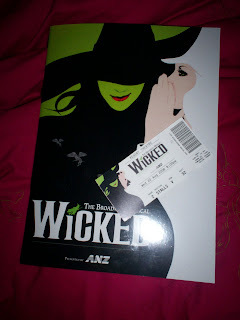 Seeing Wicked was a huge priority of my Melbourne trip so Jen and I went to the show the first night that I was in Melbourne. Generally, I am not a musical fan (well except Rocky Horror and Little Shop of Horrors). I usually find the story is only stringed together, an excuse to carry together a bunch of songs. Wicked is different. Firstly, it’s based on the book by Gregory Maguire so it has a substantial story, exploring themes of nature vs nurture, good vs. bad, popular vs freak. Melbourne, priding itself on being a cultural city, has thoroughly embraced the musical. When we had walked down the wrong end of Collins St, and stopped to ask a policeman where the Regent Theatre was, he could have told us to follow the yellow brick road. (I’m surprised there wasn’t one!). But he told us to head back in the direction we’d come, and look for the green lights. It seems that Melbourne has turned Emerald. I didn’t manage to get a photo of the Wicked tram but I did spot it (along with the Kylie tram). We left the theatre absolutely thrilled with the production – it was so spectacular especially the flying monkeys which, to my disappointment, are not featured in the program. Both Lucy Durack and Amanda Harrison (playing Galinda and Elphaba) had fabulous voices and carried the emotional heart of the show, and the storyline of Dorothy’s intrusion into Oz worked its way into the story well. I loved the twist at the end, though I suspect that the twist is not part of the original novel. (It’s going to the top of my to be read pile). I took my chances in the Wicked lottery on the Saturday night. Line up 2 & 1/2 hours before the show for your name to go in the little green barrel. As I reached the top of the queue to enter, another woman by herself was writing her name on the slip so we agreed to both tick that we wanted 2 tix so if either of our names were drawn we would get in. Over 100 people turned up to take their chances and as each name was drawn, there were cheers of excitement from the lucky few. Finally, the guy said he only had one single ticket left, and he would keep drawing until someone wanted it. Guess what? The lady I’d made the pact with was drawn out – guess I just wasn’t lucky enough!